Poetry. Latino/Latina Studies. 2016 National Book Award Finalist. 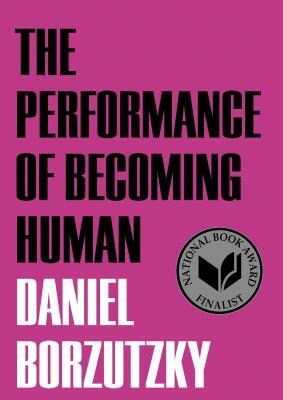 Following in the path of his acclaimed collections THE BOOK OF INTERFERING BODIES (Nightboat, 2011) and IN THE MURMURS OF THE ROTTEN CARCASS ECONOMY (Nightboat, 2015), Daniel Borzutzky returns to confront the various ways nation-states and their bureaucracies absorb and destroy communities and economies. In THE PERFORMANCE OF BECOMING HUMAN, the bay of Valparaiso merges into the western shore of Lake Michigan, where Borzutzky continues his poetic investigation into the political and economic violence shared by Chicago and Chile, two places integral to his personal formation. To become human is to navigate borders, including the fuzzy borders of institutions, the economies of privatization, overdevelopment, and underdevelopment, under which humans endure state-sanctioned and systemic abuses in cities, villages, deserts. Borzutzky, whose writing Eileen Myles has described as "violent, perverse, and tender" in its portrayal of a "kaleidoscopic journey of American horror and global horror," adds another chapter to a growing and important compendium of work that asks what it means to a be both a unitedstatesian and a globalized subject whose body is "shared between the earth, the state, and the bank." "Like any good satirist, Borzutzky considers his subjectivity with the same lens he applies to the systems he critiques, and THE PERFORMANCE OF BECOMING HUMAN is an apogee of that inquiry. Since THE BOOK OF INTERFERING BODIES, Daniel Borzutzky has been the fabulist we most need because he's unafraid to detail the truth of our oligarchy, without pedantry. In his figurative world our bodies are forced through privatized meat grinders, but funnily in the way that all dark horror stories trigger our gallows humor. I'm thrilled every time Borzutzky brings a book in the world, learn the most about reality from him." Carmen Gimenez Smith "In this canticle for the age of listicles, Daniel Borzutzky performs a new political poetry in the crucible of 'overdevelopment, ' when 'The city has disappeared into the privatized cellar of humanity.' Here, the socially engaged bro-poet is mercifully broken, relieved of his epic monumentality, and with it of a range of foundational fictions (nation/family/language/subject), leaving behind these gut-cantos (songs/fragments), detestimonios of a spectral self, at once buzz-fed and cankerously/cantankerously embodied. (You can't spell 'Neruda' without 'nerd' and Canto General never rocked 'The Gross and Borderless Body.') The ugly majesty of these prose blocks echoes the windswept expanses of neoliberal Chile and Chicago, their dead and their debt, their surrender and struggle. To read 'this book that is a country deposited not in your heart but in your mouth' is to confront becoming human as speech act, as language game, and to know the freedom and the terror of doing so. The painbeauty of Borzutzky's virtuoso, multi- register flow (abject punchlines included) is also a counter-flow to the death drive of capital, sentences for a radical sentience." Urayoan Noel. Daniel Borzutzky's books and chapbooks include, among others, IN THE MURMURS OF THE ROTTEN CARCASS ECONOMY (Nightboat Books, 2015), Bedtime Stories for the End of the World! (Bloof Books, 2015), Data Bodies (2013), THE BOOK OF INTERFERING BODIES (Nightboat Books, 2011), and THE ECSTASY OF CAPITULATION (BlazeVOX [books], 2006). He has translated Raúl Zurita's THE COUNTRY OF PLANKS (Action Books, 2015) and SONG FOR HIS DISAPPEARED LOVE (Action Books, 2010), and Jaime Luis Huenún's PORT TRAKL (Action Books, 2008). His work has been supported by the Illinois Arts Council, the National Endowment for the Arts, and the Pen/Heim Translation Fund. He lives in Chicago.